Being an engineer my mind always thinks of using science to solve practical problems. And when I used to think about lighting, I always used to think: why don’t we effectively use sunlight to light a room during the daytime? Why do we have to use electricity? When we were kids, while playing we used to use mirrors to reflect light on to each other. When I grew up I used to think of using such simple concepts to harness sun light to light a room during the day. And I was pleasantly surprised to find something similar a few days back. While doing our research, we found that there are Sun Tunnel Skylights available in the market that do something very similar. They capture sunlight or natural light from the atmosphere and pass it on as light in the rooms. 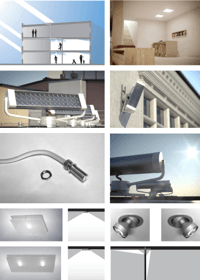 A light collector: Which collects ambient light available in the atmosphere from all directions, even at low angles and delivers it to the internal unit. A light pipe: Which is mostly a reflective system that uses principles of reflection to transfer the light to various locations with minimum light loss and color shift. 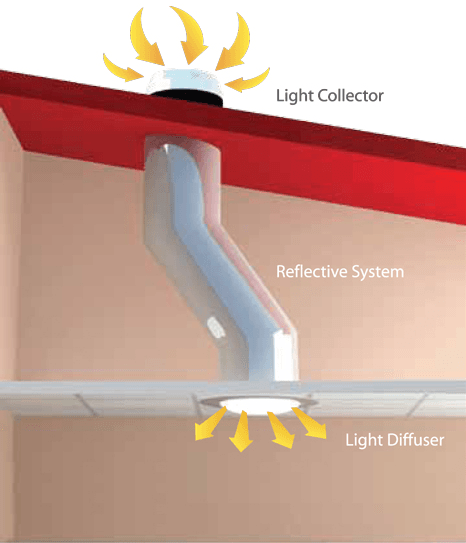 Light Diffuser: Which distributes the collected light in the indoor just like how a bulb would do. Such a solution can effectively take daylight to dark corners and false ceiling covered areas. It can extend daylighting hours in many industries, workshops or commercial locations. And they can deliver uniform lighting across the area throughout the day. They can be used along with photo sensors so that when light is less outside, the system automatically shifts to electric lighting. Such a solution can be ideal for dark basements, workshops, car parking and every such location where daylighting is difficult. Such solutions initially started with pipe based system but have recently graduated and also come in fiber optics based solutions. Ceiling Mounted solution: As the sun is available more from the ceiling, such solutions are more effective in collecting light. As the pipes are reflecting, they can bend even up to 90 degrees and deliver light effectively. Wall Mounted Solution: If you do not have access to ceilings then there are wall based solutions available the have a horizontal setup with light collector on the outside of the wall and diffuser delivering the light inside. Pipe based system can deliver light up to 15 m away from the source effectively. b) The fiber optics based solution provides much more flexibility on bends and can reach up to as far as 20 m from the source. The collectors of such system can be wall mounted or roof mounted as per availability of space. This kind of system also provides flexibility to use types of luminaires to suit the ambience of the room. Using solar panels to generate electricity is good but if daylight can be used for lighting, it is better to use such a system during the day and use electricity generated through solar panels at night. This can help you reduce the size of solar panel system that you need for your setup. And the good thing about such systems is that it needs minimal maintenance and can deliver free lighting for a long time.